Your recurring contribution receipt contains a link that allows you to modify your payment information. Clicking that will bring you directly to a page where you can update the credit card for a specific recurring charge. For example, if you have a recurring contribution and your credit card expires, it will be helpful to follow this link. If you have any trouble with this, always feel free to contact us at info@actblue.com. 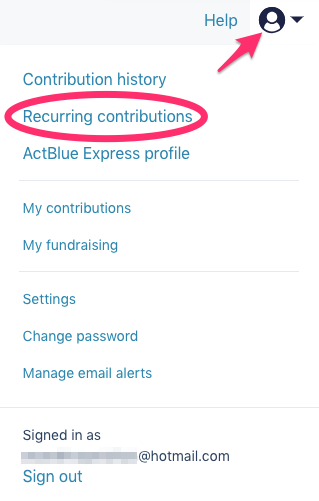 You can also do this by logging into your ActBlue Express donor profile to access your Recurring Contribution history. Once you log in to ActBlue, you will be brought to the My Contributions page. This will bring you to a list of your recurring contributions with the option to edit them. Click either option to open up a menu and edit your contribution information. Personal information such as the contact info and billing address associated with a specific recurring contribution cannot be changed. To update your personal info for a recurring donation, you can cancel your current donation and set up a new one with the correct info. You can also get to the Recurring contributions page from the User menu. Click the blue person icon in the navigation bar at the top of your screen to open the menu. 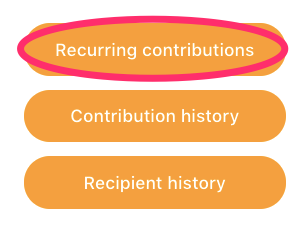 Then select "Recurring contributions." If you have questions or need help, you can contact us here.